I’m on part one of my travels – hanging out with my BFF in the Boston area. Tomorrow is part two; I’ll head down to Washington DC tomorrow for a few days of work. I have lots of blog ideas percolating in my head and hope to post in the next day or two. I bought a book at the airport and, wow, it’s giving me lots of good food for thought. The book is the follow-up to Eat, Pray, Love by Elizabeth Gilbert called Committed: A Love Story. I don’t want to write today anyway. My heart and thoughts are with my sister-in-law, nephews, and in-laws who are marking the first anniversary of my brother-in-law’s death today. All the love in my heart going out to them today. Dude, it totally snowed yesterday! Finally. We haven’t had snow since the first week of December – even when the rest of the U.S. was snowed in. Just enough on the ground this morning to make everything look a little prettier, a little brighter, and enough to make the commute interesting. Last night I finally sat down and filled out the 15 page assessment called a SIB-R (Scales of Independent Behavior-Revised) for Jamie. The purpose of the SIB-R is to assess adaptive and maladaptive behavior to determine need for assistance. The school psychologist will provide his own assessment and, from those and the diagnoses we have received from doctors, we will officially change Jamie’s status from developmentally delayed to Autistic & ADHD. This could potentially change the amount of resources he receives from the school district, and it has an influence on his ability to be included in various other state & federal programs for “disabled” kids. (I hate that label). The challenge for these types of assessments is to grade your own child as bad as you possibly can. Don’t give them the benefit of the doubt that they can do something on their own. If you think they may struggle doing something for themselves then you must grade them low. It goes against everything that we, as parents, hope for our children – they they CAN do things and that if they did it once they can do it again. It’s not fun to spend an hour thinking of your child in this derogatory context. On a more cheerful note – tonight I start packing for a trip! This trip will be good because I’m combining work AND pleasure. First, bright and early Saturday I’m flying to Boston to spend 3 nights with my BFF. We are spending the first night in Boston at a hotel and going out with friends. Woo-hoo! Then going to her house in New Hampshire until Tuesday morning when I fly down to Washington, D.C. My company has a office just outside of Washington that I travel to a couple times a year. While there I have plans to get together with two more friends and hang out with the co-workers at that office. Fun stuff! I’ll be exhausted on the flight home but it should be a busy & fun week. The day after I get home is my husband’s birthday. What to do, what to do. I know I need to take him shopping for his gift (he has requested sunglasses) but I should think of something else. He likes a big to-do. Hmmm. I’ll probably make cake balls, at least. Is it too early to start looking forward to our annual summer vacation in July?? On Friday I was very happy to spend some time just being a mom, see my post here: My warring dualities. Then I took yesterday off and wrote a blog, had lunch with my hubby and picked up my kids from school again. The kids were happy, I was happy, and the hubby was happy. I thought about how much happier we all were and I’ve come to a decision. I WANT TO BE A STAY AT HOME MOM. Or a work part-time from home mom. I’m happy to pick up a little income here and there as I can. I want to take care my my kids, my husband and my house. I want to get my home life in order. I want to have the time and energy to focus on just those things for a while. I need it. My family needs it. I would be a good SAHM. I would have a routine. Certain days I would clean house. Certain days I would do laundry. I would make time to exercise every day. I would turn the music up LOUD and not worry about anybody seeing me work out. I would write on this blog more, and possibly write something else. I would pay bills, clean, clean, clean, and work on projects like the closets or washing all the windows. I would run all the errands I don’t have time to do now, and do the grocery shopping too. I want to be there for my son EVERY TIME he needs me in class. Both of them, really, but in particular for my Autistic guy. When he has a bad start to his day I want the freedom to be there with him as long as he needs me. I want to pick him up from school so I get the low-down from his teachers every day. I would be an advocate for my son and for Autism education and support in my state. Every day after school I would talk to my boys. I would give them an after school snack, talk about their day with them, and get them started on homework. I would start dinner while we talk so that we can eat dinner early and get a walk before bath and bedtime. Yes, I do know that to a certain extent I am idealizing being a stay at home mom, but I also know that whatever came up I would be able to deal with it. I’m a good multi-tasker and I can make adjustments on the fly. I know it’s a lot of work. I know it. I’m gone from my house and family 10 hours a day and it’s not working for me right now. I need more of the kids in my daily life. I need more “me” in my daily life. I want to write. I want to be the best mom and person I can be. I need a change in my life – my career and my health demand it – and I think this could be it. P.S. Now that I have made this decision if someone could please hire my husband at an exorbitant salary so that I can make my SAHM dreams come true I would be ever so grateful. I am a full-time working mom with a fairly demanding job. I work until 6:30-7 (or later) every night. Most nights when I get home I clean the kitchen and make dinner and help with homework if needed. Or, like last night, assist in the filling out, folding, stuffing, and stickering of Valentine’s. Then there’s the whole getting the kids ready for bed thing. The hubby freaks out if the kids’ room is messy at night so it has to be picked up. Every. Night. Then sometimes I’ll sit down at my desk and work even more. This is my daily life. But some days, like today, I get to enjoy the other side of me that I don’t get to tap into very often during the working day. I got be a mom, just a mom, for a while this afternoon. It was wonderful. My little guy was diagnosed as High-Functioning Autistic as well as ADHD a couple years ago. It wasn’t a shock – we knew it was something. My 3rd grader is ADHD too; the hubby and most of his family are as well so I suppose it’s no surprise that the kids inherited that gene. 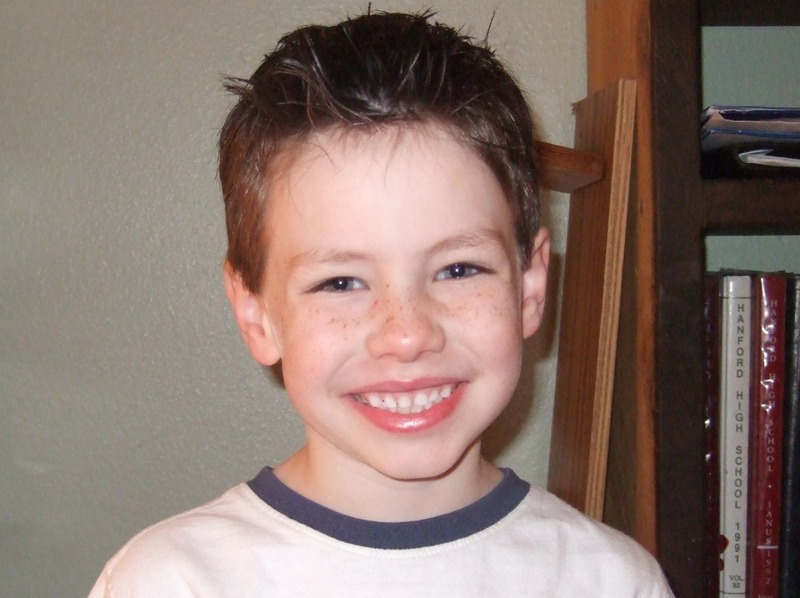 Back to Jamie, my bubba – he’s really the cutest kid. Sweet and so loving. He’s my little cuddle-bug. He’s learning so much. Maybe we have always low-balled him because of the Autism, but when he does something well (that is learning level appropriate) we are just ecstatic. Maybe it’s because we’re scared he’s going to go backwards instead of forwards. Each time he reaches a milestone we are over the moon. He can seem normal. Sometimes he acts like any other 1st grader. But there are definitely situations we have to deal with more carefully than we would with our other son. Like when we know that his class will be doing something out of the ordinary we have to prepare him for it in advance. Talk it up to him several times and make him aware of everything that’s going to happen. Sometimes I think we forget to do that as much as we should. It really shouldn’t have been a surprise when he started being belligerent and difficult this morning. Right before leaving to go to school he got very upset because he didn’t like the way his hair looked and started insisting that it be parted the other way and beating his own head with the brush. I soothed him as best I could, and then I left to take the 3rd grader to school before going on to work. The hubby called 30 minutes later and said it took him 20 minutes to get Jamie calmed down and into his class (tardy, of course). I thought, oh boy, that does not bode well for the rest of the day. So I called the school to find out when Jamie’s class party was going to be. Then I looked at my schedule and decided I could make it work. I left the office at 2:30 and, oh, I can’t tell you how liberating it was! (I swear I would be an awesome stay at home mom. I would, I really, really would.) Jamie was SO excited when I walked into class. I got to watch him interact with his friends and play games and he did it all so well! You wouldn’t have known he was different. My heart swelled. When the party was over we picked up the 3rd grader and decided to get a Redbox family movie to watch on this lovely Friday night. As I was driving down the road at 4 pm with my kids chattering in the backseat I must say I was as happy as I have ever been. Oh, we have problems aplenty and I like working . . . but, really, none of that mattered at that moment. Yes, I would be a very good stay at home mom indeed. I overslept this morning. It’s true, it happens. My alarm didn’t wake me up because I’m blessed with having a very curious 6 year old who likes to fiddle with things – like the volume knob on my clock radio. I prefer to think that he just knows when his mommy needs a little more sleep. But this morning, when I sleepily turned over and focused my eyes on the clock to see 7:54 am, I wasn’t thinking, “Oh, an extra hour of sleep – bless him!” I was thinking, “ACK!! I have a meeting in an hour! !” Jumped up, turned the shower on and did all those first thing in the morning things. As I was lathering up in the shower I kept thinking, “Ack! I hate being rushed!” Then it hit me – I’m SO Cathy this morning!! Remember Cathy? Then the situation just turned comical and I laughed! What’s the point of getting all irritated? Here’s the best part, are you ready? Yes, baby, it was a thief. 1. That’s how I feel trying to “birth” this blog – oh the pressure . . . of the words. What should I say? I feel compelled to start it though I have no clear purpose or any particular knowledge to impart. The plan for this blog is yet unplanned. I hope it will be my outlet. When I have something to say I can say it here. One day it will have pictures and the next it will have a poem, or a rant. I thought I might have a clear purpose, a theme, but the more I thought about it the more I realized I’m just a bit too random to adhere to a theme. Everyday will be different – a topic du jour, so to speak. 2. I think a lot of what I write about will be my life and all the trials and tribulations therein. My life as a mom, a wife, and just how, exactly, to be super woman. (I’ll let you know when I get that one figured out – should be happening any minute now). I think the most obvious theme if, in fact, there is a theme at all, is there is no one happy ending – there are LOTS of them – and we learn as we go. They aren’t all about being rescued (though some are, and for those I’m grateful) but some happy endings are just about an increased awareness, or perception, of a situation that allows us to ascend to the next chapter in our lives. Growing up? Yes, maybe. Growing in knowledge and experience? Definitely. So – if you are up for it, come along with me and let’s figure out a few things, okay?